A Leeds United supporters organisation looking to buy a minority stake in the Elland Road club has launched its first fundraising scheme. Leeds Fans LLP has set up the The Leeds Fans Community Benefit Society (CBS) aiming to raise up to £10 million to be put towards buying a first stake in United. Supporters will be able to invest between £100 and £10,000 into the new scheme from Tuesday, April 7. Dylan Thwaites, chief executive of the organisation explained: “We want to get the largest possible number of people on board and in doing so make this the biggest fan fundraise ever seen in the UK. Leeds Fans Community Benefit Society is to be the first of three fundraising initiatives created by the group that are together targeting £10m target. Later this month will see the launch of an organisation aimed at fans wanting to put larger amounts in the initiative and also then a foundation that will allow companies and philanthropists to invest. The group has gained the support of a number of public figures and former players including legend Allan Clarke, who is the official ambassador. 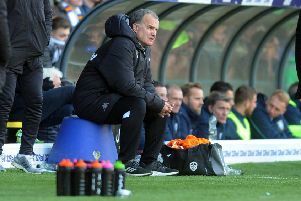 Clarke said: “In recent years the Leeds supporters have proved time and time again that they’re as loyal as they come. “What they deserve is to have a bigger say in how the club is run.